Niantic, the company behind Pokémon GO, has recently announced that they’re working on a follow-up to their monumentally successful Augmented Reality (AR) game. Pokéballs and Pocket Monsters move aside; and wands and wizardry will take their place as next AR craze will be J.K. Rowling’s Harry Potter being brought to life. And my kids — and millions of kids just like them — will be eagerly awaiting the day they can hit download and start casting spells from their smartphones. This announcement is a clear indication that AR is an industry gathering pace, but where does it leave the major players? Are they ready to sprinkle a little bit of their own magic on proceedings, or will they be left looking like muggles? Well, I think we’re witnessing a defining moment for both AR and the wider IT consumer market. And just as so many were bewitched by the battle of Hogwarts, I’m captivated by another fascinating clash: Virtual vs Augmented Reality. In one of the biggest battles for the mantle of ‘next big thing’ in consumer tech, it’s interesting to note that Apple didn’t participate. While others, such as Google, Samsung, Facebook, Microsoft, and Sony all launched VR products, Apple’s CEO Tim Cook admitted VR was ‘really cool’ without giving much else away about the company’s possible involvement in the industry. But Cook is on record as having championed Augmented Reality, calling it ‘as big an idea as the smartphone’ and one he believes can be mass-marketed. This was hammered home in September 2017 when, during the iOS 11 launch, we were introduced to the ‘ARKit’, which is set to provide developers with a framework to develop AR apps for iPhone and iPad. Over the last few months, it would appear that AR has grown in stature thanks to Apple’s position. They’ve also improved camera capabilities (iPhone 6 and above) to ensure users can access AR experiences without needing to update their hardware; a move that, in my opinion, only strengthens Apple’s outlook on the potential of AR vs VR. Meanwhile, on the other side of the battleground, Mark Zuckerberg has presented his vision for the new Oculus Rift, Facebook’s VR headset. Named ‘Oculus Go’, this standalone device will be launched soon for the relatively affordable price of $199. And HTC Vive plan to launch their own standalone headset in the coming weeks. The significance of this is that the standalone nature of the device renders the need for a PC or smartphone to run the VR app obsolete. With the processing unit present inside the headset, VR becomes less restrictive and more accessible. This certainly enhances the possibility of VR being more affordable in the not-so-distant future, and with more than 10 million units being sold over the last 18 months, there appears to be a groundswell of interest in VR. But how does it compare to AR? Well, the very fact that all AR requires is a modern smartphone device upgraded to the latest operating system puts VR in the shade. The accessibility of AR technology means it already has a potential audience of upwards of 400 million iOS 11 users — 500 million if your include Android ARCore. You only have to look at Pokémon GO to understand the heights a popular AR game can reach. But I suspect even that was merely scratching the surface. When it first launched, Pokémon GO was massive. And, despite what you might think, it still is. It broke all sorts of mobile game and app records on both the App Store and Google Play, surpassing 750 million downloads and $1.2 billion in revenue by the summer of 2017. But I’d argue that Pokémon GO wasn’t ‘true AR.’ Most of the game was played in 2D, and even the animated characters were augmented in 2D on top of the screen. Of course, ARKit or ARCore weren’t available at that time, and AR capabilities were limited. I’d also argue that, while Pokémon was a popular brand for both kids and adults prior to the launch of the game (which undoubtedly contributed to its success), Harry Potter is a much bigger and more powerful brand. Harry Potter AR — are we about to see something special? I believe that many Pokémon GO players will also be fans of Harry Potter. They’ll be the early adopters of Niantic’s next game, further strengthening their enjoyment of Augmented Reality. But more importantly, they’ll show the game to their friends, family, teachers, and neighbors. They’ll become ambassadors of AR, and share the app with their fellow Potterheads, to the point where many more people will know just what Augmented Reality is. This will give other brands an ‘in,’ helping them utilize AR capabilities in their own apps, changing the 2D mobile experience into a modern and immersive 3D one. I still remember people describing the moment they first bought a color TV after watching black-and-white for years. This upcoming AR game can become a similar watershed moment in the lives of many smartphone users. 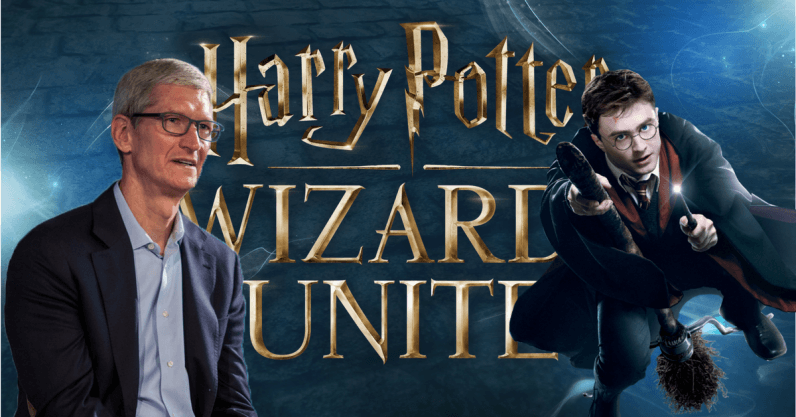 And we’ll have at least two people to thank, both of whom wear glasses: Harry Potter and Tim Cook. Harry already has his place in our hearts, while Tim’s still looking to secure his own Apple legacy and step out from Steve Jobs’ shadow. Together, Harry Potter’s AR game and Apple’s technology could open consumer tech to the next big adventure.